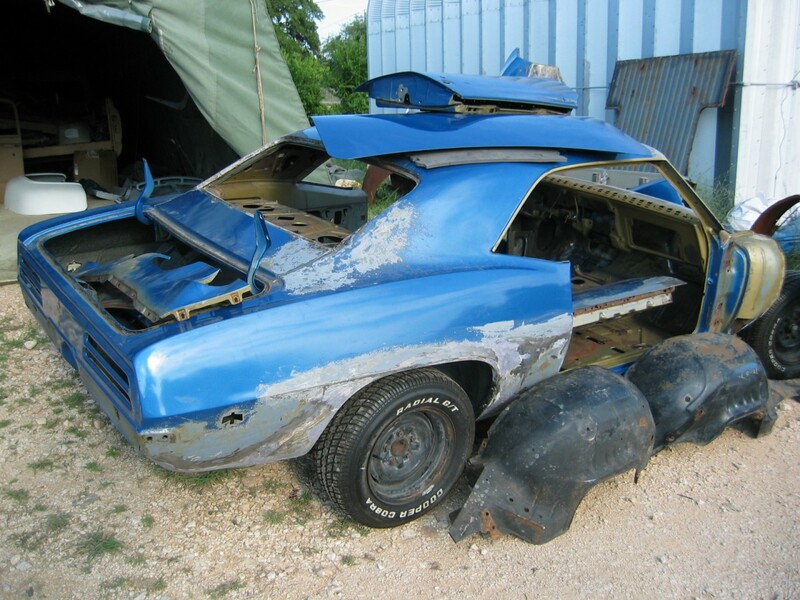 This '69 Firebird lived most of it's life in Houston, Texas. It's not an extremely bad place for older cars, but it's definitely not the best. It rains quite a bit, and the humidity hovers around 75%. Needless to say, I had a bit of rust I needed to fix. I wanted to learn how to do the metal work myself, so I went out and bought a Craftsman gas/gasless MIG welder. I had a friend come over for an afternoon and give me a crash course in welding. The rest I learned through trial and error. I guess the car lived under a tree for a long time because the whole passenger cowl area was full of leaves from the bottom to the top (including the blower motor). These leaves, when wet, produced the rust hole shown. I removed the bad metal, welded in new metal, and grounded it smooth. 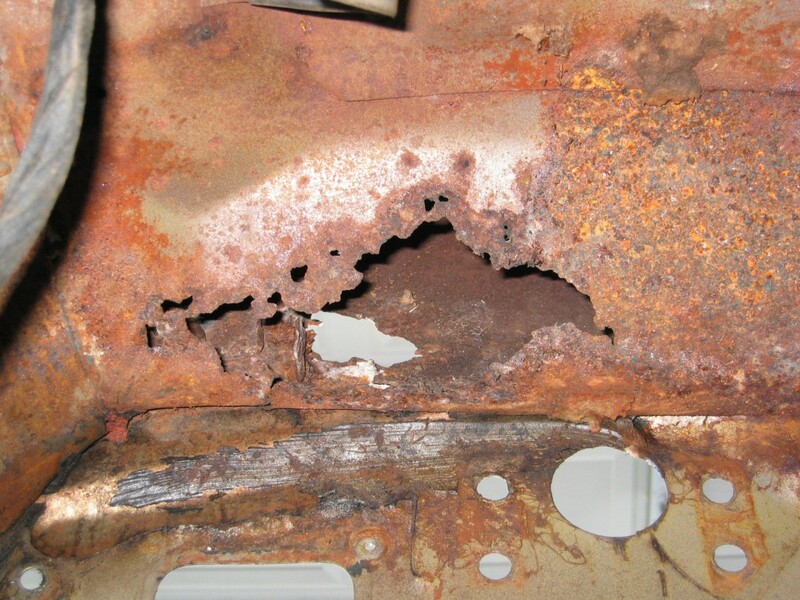 This rust hole was near the horn relay on the firewall. 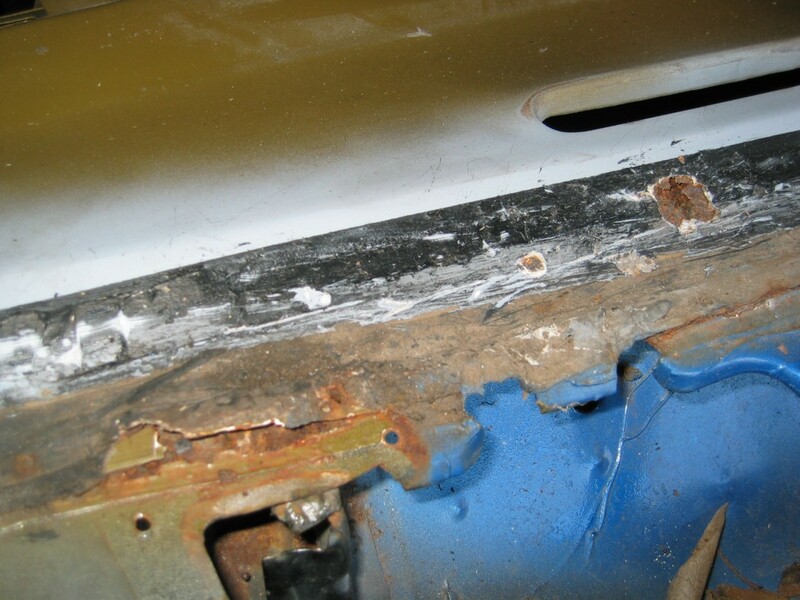 It was caused by water pooling on the lower cowl and rusting this area out. 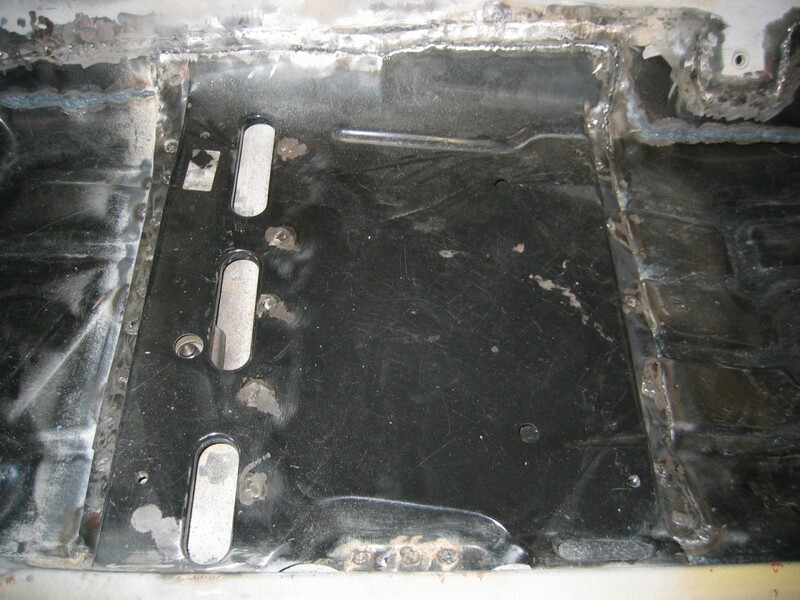 As water pooled on the lower cowl (panel above the pedals), it proceeded to eat a rather large hole . This picture was taken from the inside. The holes on the lower right are for the brake booster. I actually had to cut out a lot more metal than I initially thought. 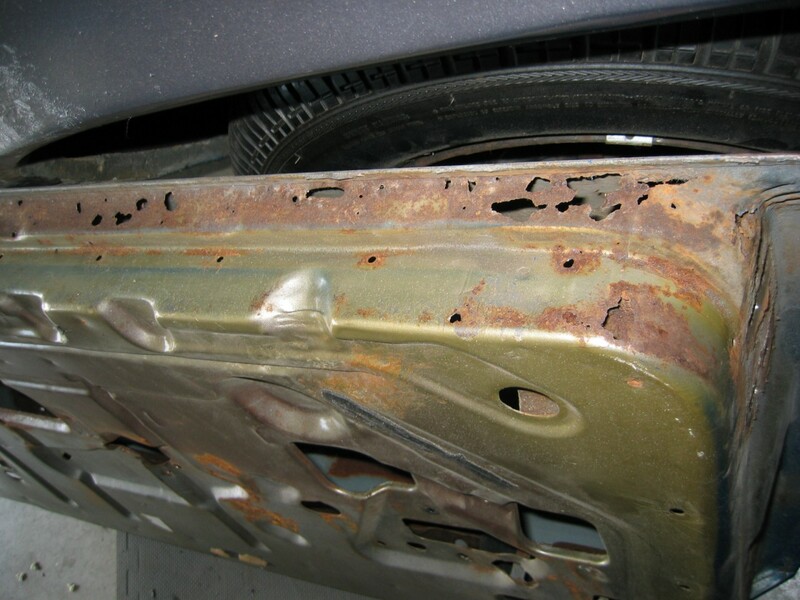 The rust had completely rotted a small area, but the surrounding metal was very weak. I cut and bent my own metal used on this repair. 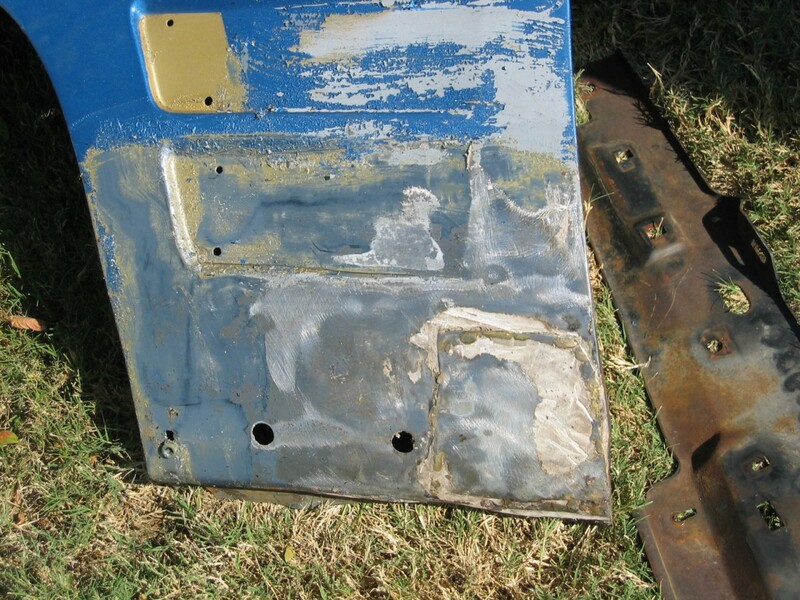 This shows how far to the right I actually had to take the repair panel because of the weakened original metal. After scribing a line that marked the height of the new replacement floorpan, I cut out the old metal. 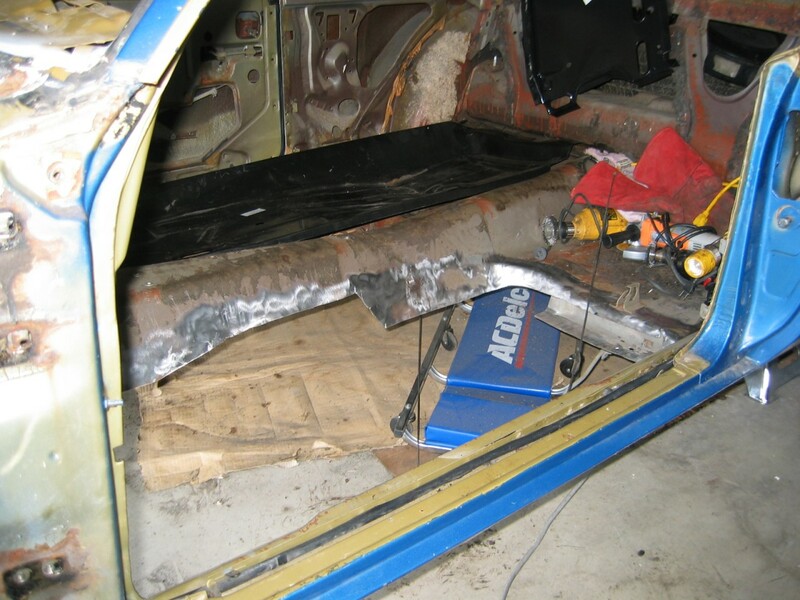 I left an overlap all the way around the floorpan to help ease the welding of the new panel. 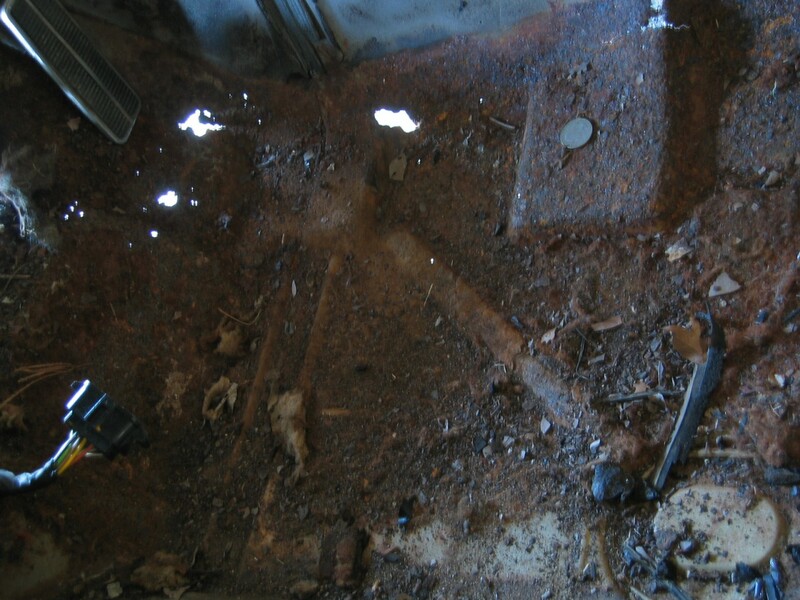 Here is another view of the removed floorpan. The cutting out was the easy part. 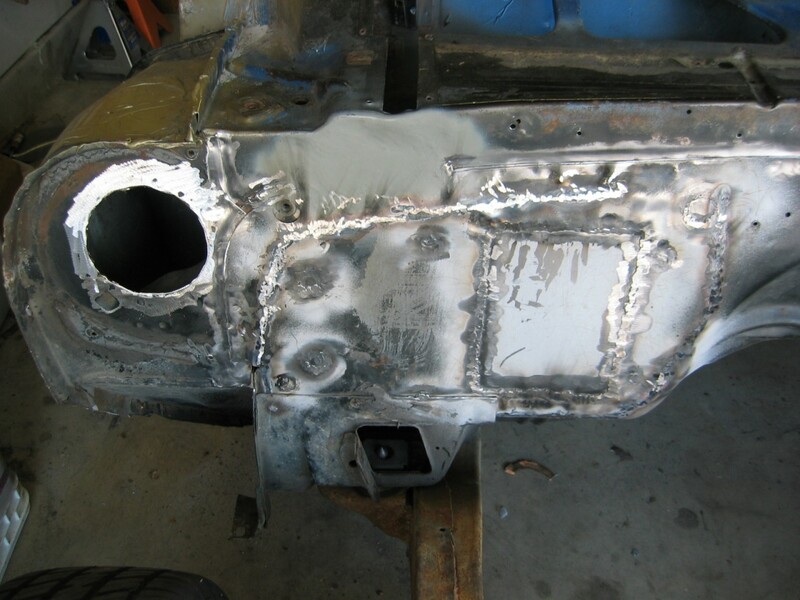 I welded the new floorpan from both the inside, and then from under the car. 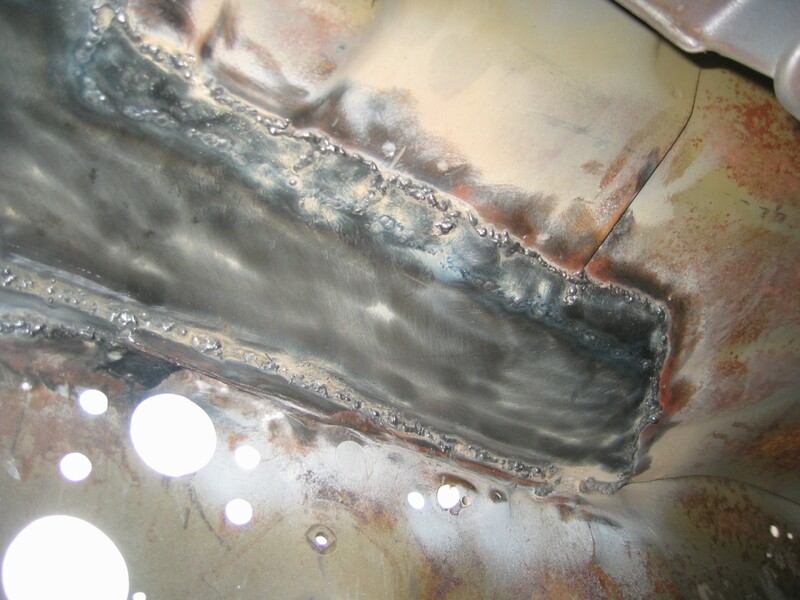 If you look at the transmission tunnel, you can see the two rows of welding marks which indicate the inner and outer welds, and the amount of overlap. On the rear of the floorpan, I left the seatbelt attaching nut on the body of the car, and cut the floorpan to fit around it. 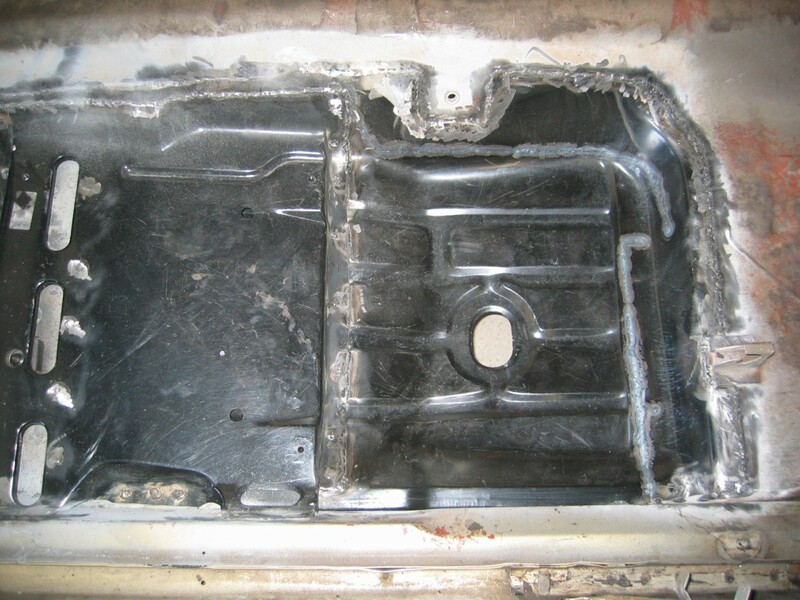 I also cut the new floorpan to fit around the lower rear seat bracket. I also had to install a new driver seat frame floor support. The original one was far to rusted to re-use. Here is a view of the front of the completed floorpan. 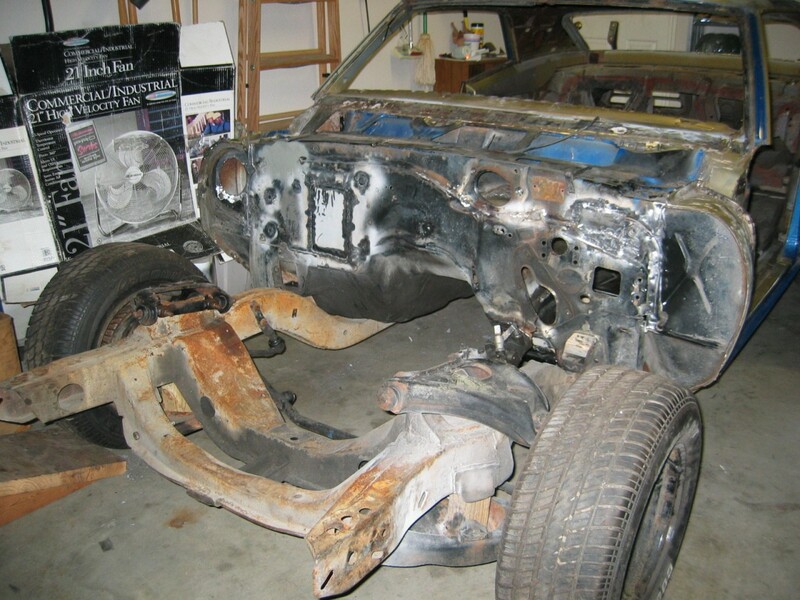 Notice that I also had to replace the toeboard between the floorpan and the firewall. 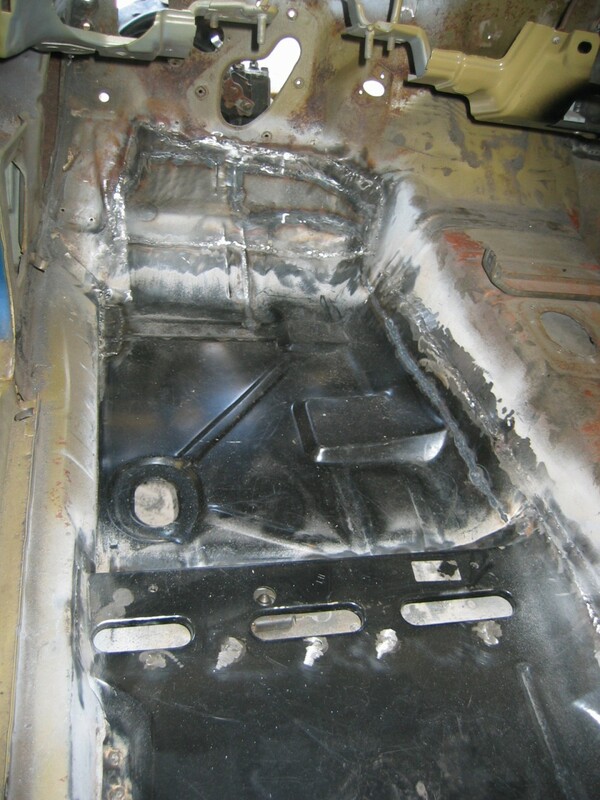 The completed middle section of the floorpan with the new seat frame floor support section. I decided to go with Vintage Air instead of the factory A/C system. 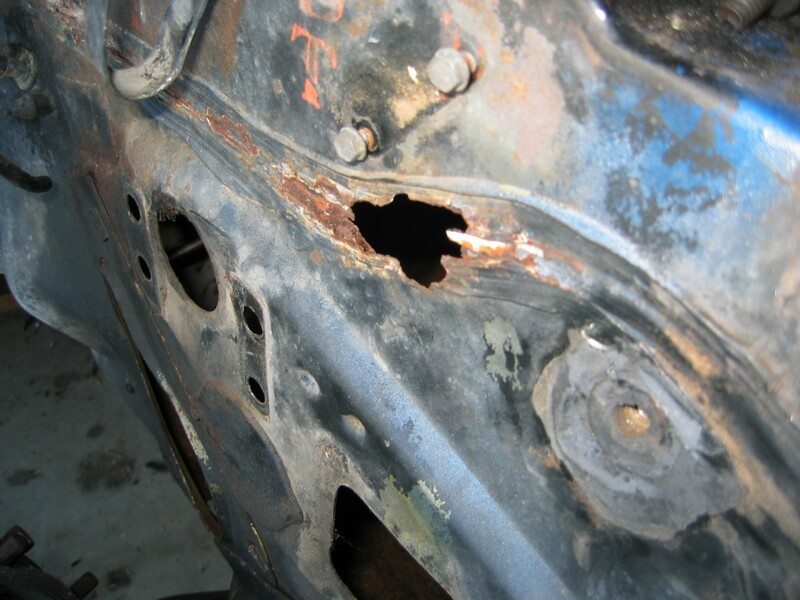 Because of this, I fabricated a panel and welded up the old holes in the passenger firewall. This shows the new patch panel that I welded from the inside. 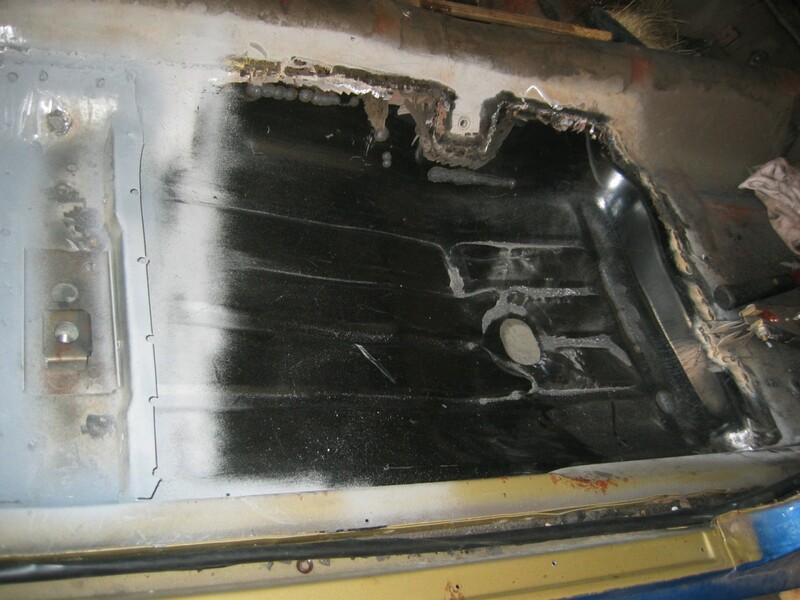 The new panel was placed on the inside, and then welded on both sides to the existing firewall. 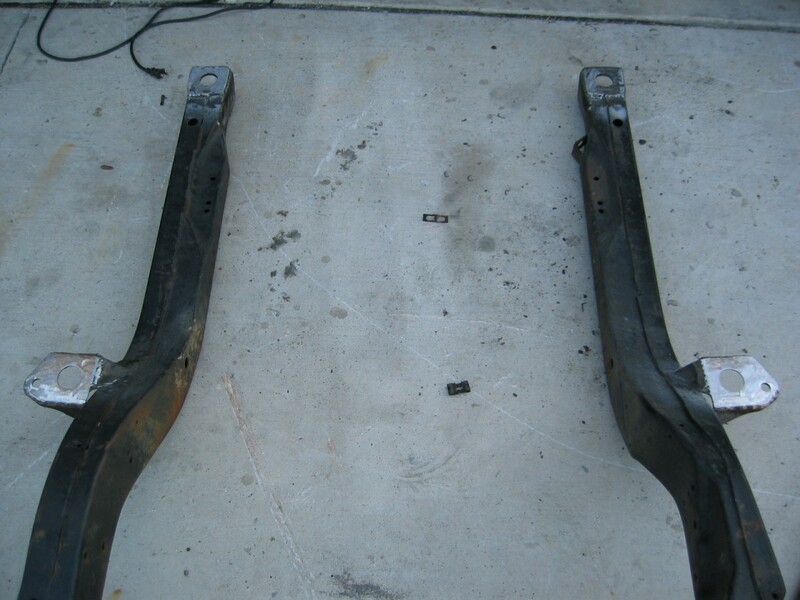 The front two subframe mounting holes were rusted. So, I purchased a kit that included pre-cut plates that you weld onto the original subframe to repair the commonly damaged locations. I lost the original pre-repair pictures. 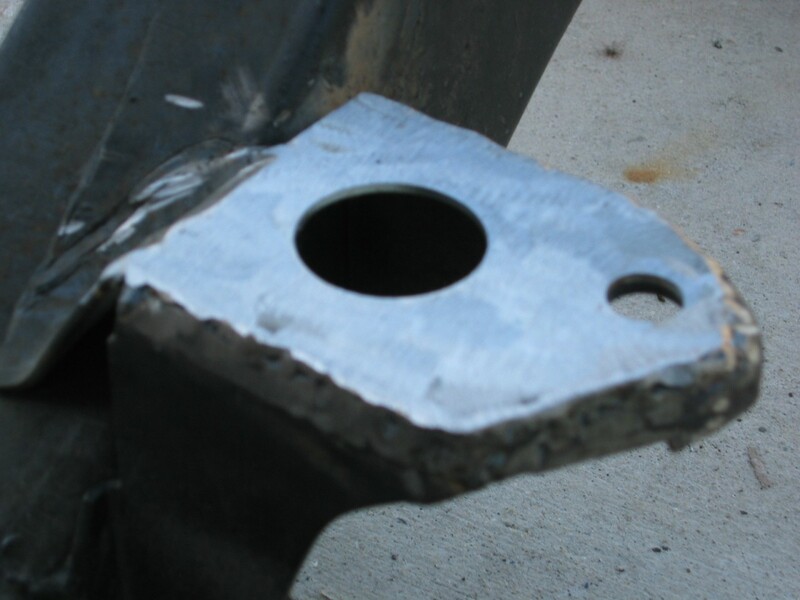 Here is a closeup of one of the repaired subframe mounting holes. Above, I mentioned that the whole area underneath the cowl panel was full of leaves. This is the bottom of the passenger cowl that rotted out due to the leaves. I simply removed the bad metal and Rust Encapsulated around it. Yuck. After inspecting this door more, I decided that it would take too long to try to repair the bottom that was completely rusted out. Instead, I found a solid donor door, removed the dent in the center, and used it. I found a hole on the lower trunk panel behind the passenger rear 1/4 panel. Strange looking damage, it didn't look like rust. Oh well. I decided to let the body shop fix it while they worked on the 1/4 panel. There was quite a bit of damage to the lower windshield channel. I also decided to let the body shop take care of this piece. I had the car media blasted at a local shop the week of my 30th birthday. After the media blasting, the car went directly to the paint and body shop. These next few pictures show the car the day it left my house. You can see all of the metal work on the interior here: driver floorpan, lower cowl above pedal, and passenger firewall. This was the last time I'd have to look at the original ugly gold interior!!! Looks like this fender is going to need some work at the body shop after it gets blasted. Someone else before me did a bad patch job. Doors: Check. Fenders: Check. Inner fenders: Check. Upper Cowl: Check. Lower valence: Check. 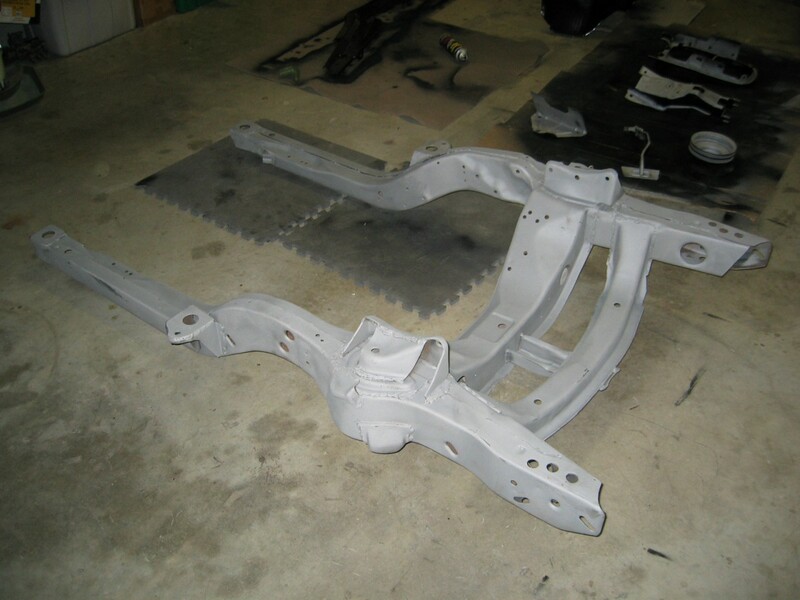 Subframe: Check. OK, we've got everything ready to go to the media blasters. It arrived in my garage on a late night in mid-April 2004, and left for the first time 4 months later, in August. 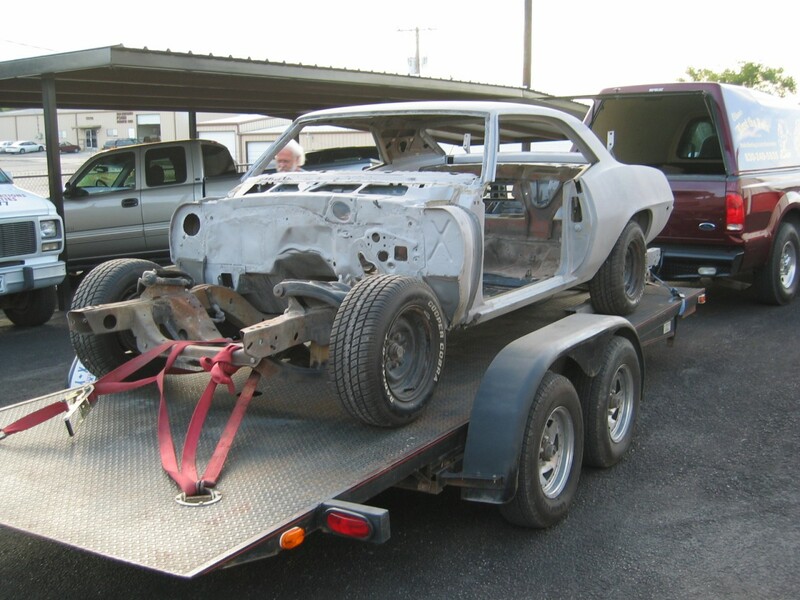 The Bird still looks good totally stripped down and on the back of a flatbed. We pulled up and offloaded the Bird at the media blasters. What a strange picture. 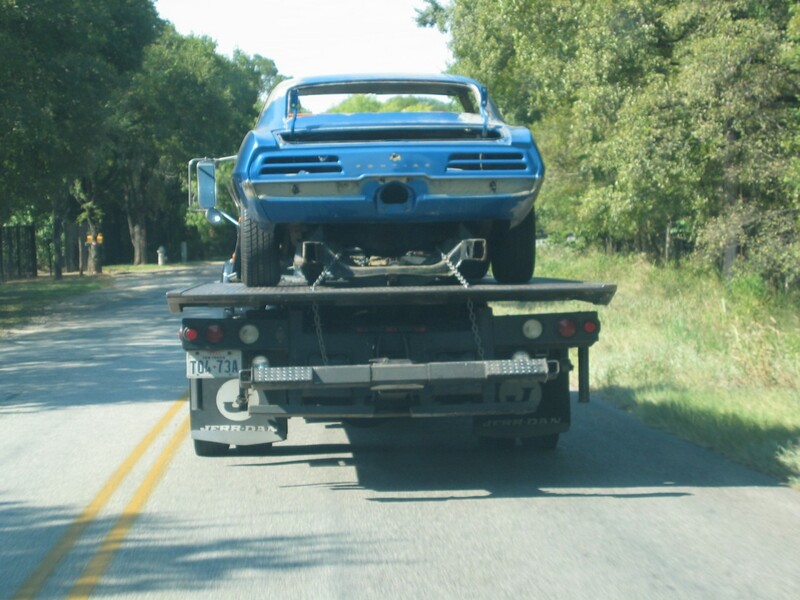 All the body panels and pieces of my Bird are here, just none of them are attached to the car. More pictures from the rear of the car the day I left it at the media blasters. 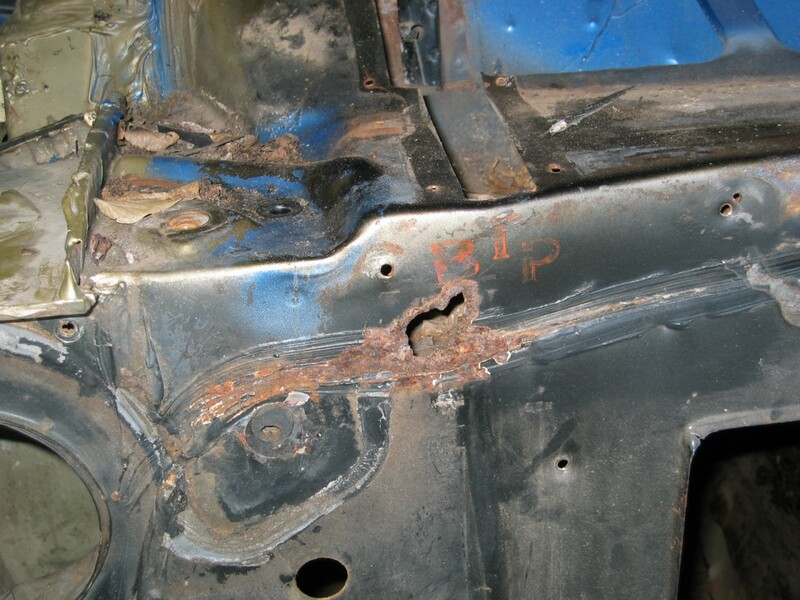 The car was delivered to the body shop two days later from the media blasters. 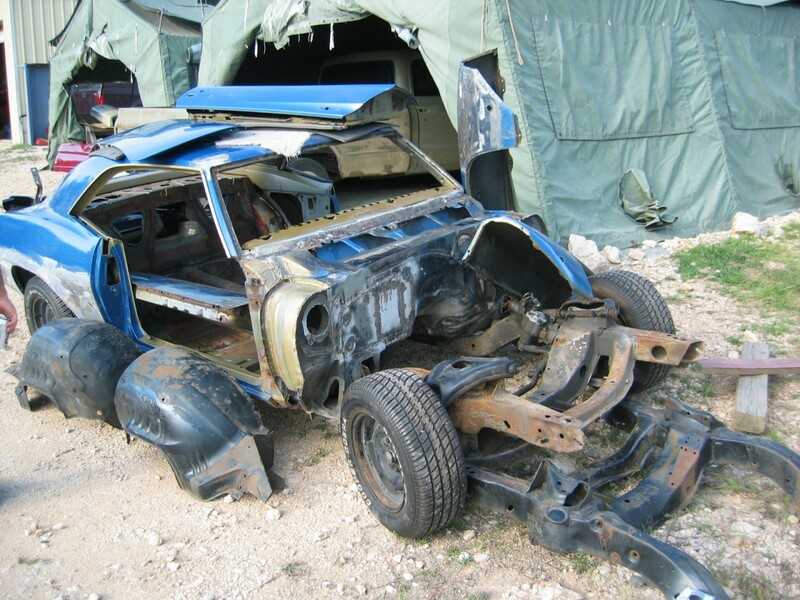 Now we could see exactly what body work we had to tackle to get the car done. 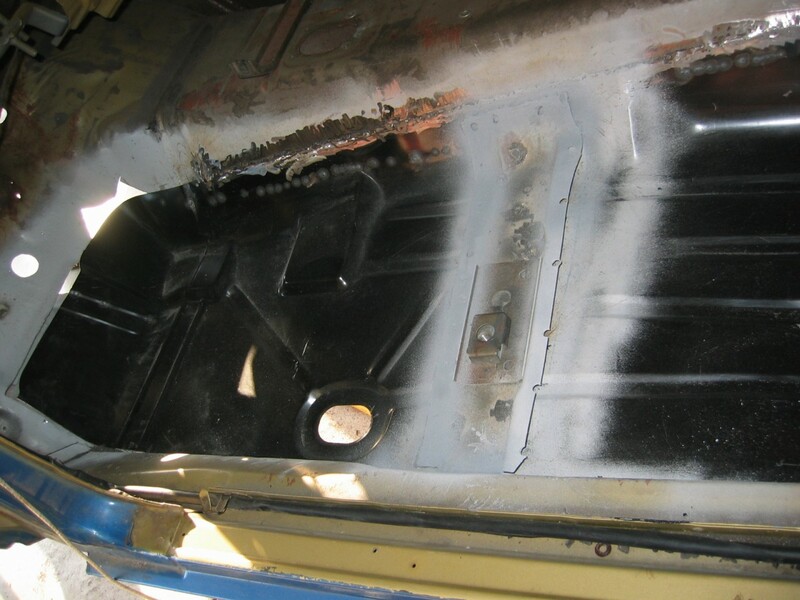 The media blasting took all the paint and 90% of the bondo off the body of the car. It was easy to tell what work needed to be done. Here, if you look close below the right tail light, you can see some little holes that were weak metal that blew through when hit with the media blasting. A little bit on the driver rear quarter panel. On the passenger front quarter panel there was a bit of repair from previous work done to the car. Most of it was still intact and in good condition, it just need to be smoothed out. The passenger rear quarter panel was a different story. There was previous work done to it, but it needed to be re-done. 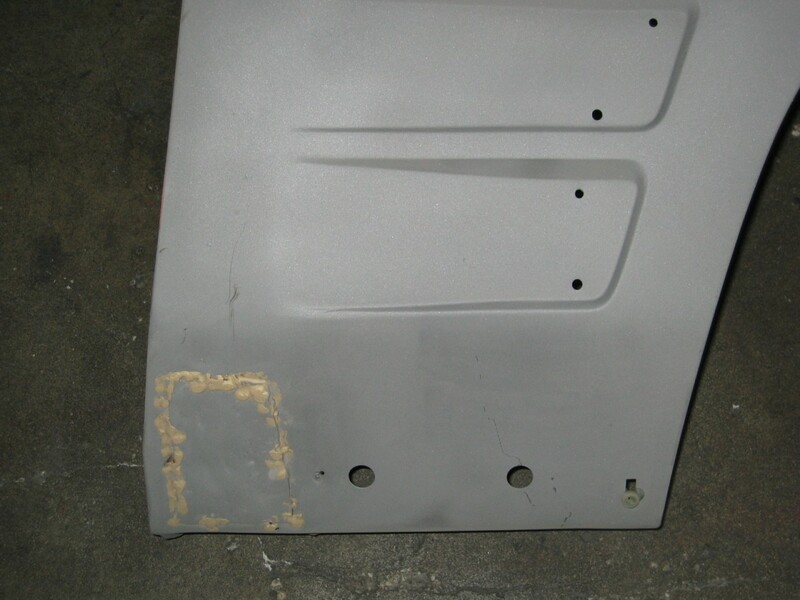 Also the passenger lower trunk panel that attaches the quarter panel to the trunk had a big hole in it (shown above). All of this would need to be replaced. Here are the doors, upper cowl, lower valence, and lower air dam. 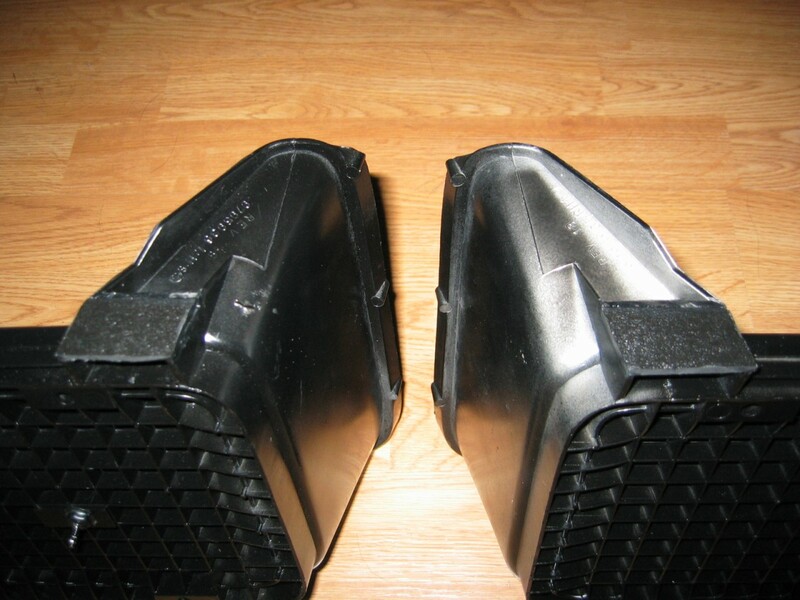 Here are the two inner fenders along with the large upper piece that sits in front of the radiator support. Hmmm. 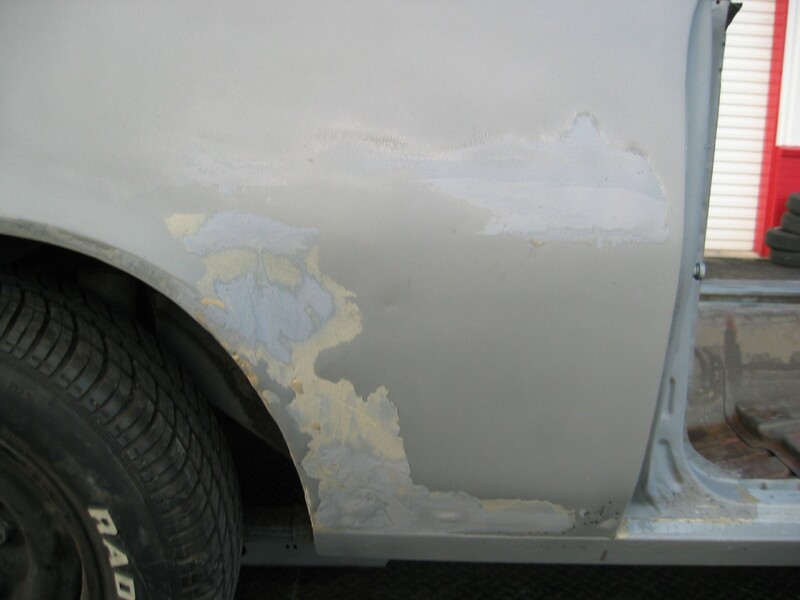 Yes, there was previous repair work done to this fender. Looks like it was done in a hurry. Gonna have to fix that. 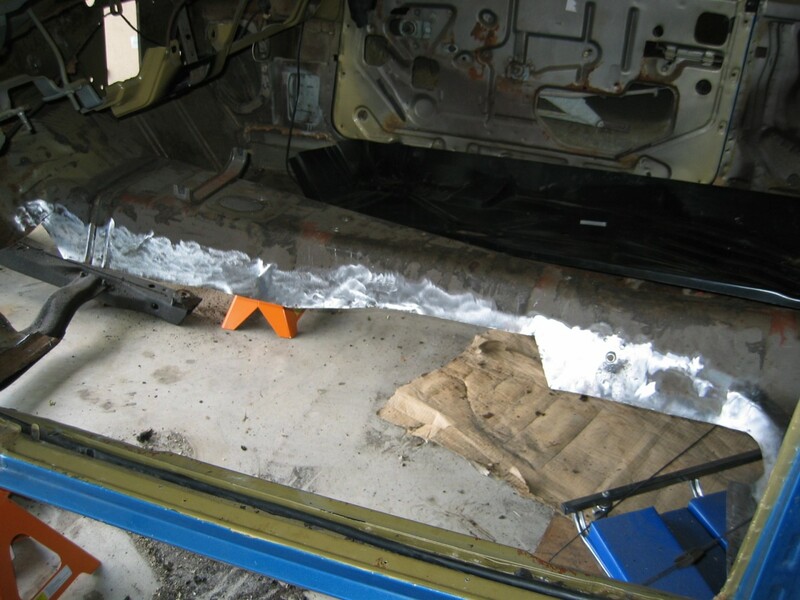 And finally, the newly blasted subframe. The Bird spent almost 5 months at the body shop. It was a strange and sad set of events. There was a '70 Charger in line before my car at the shop. 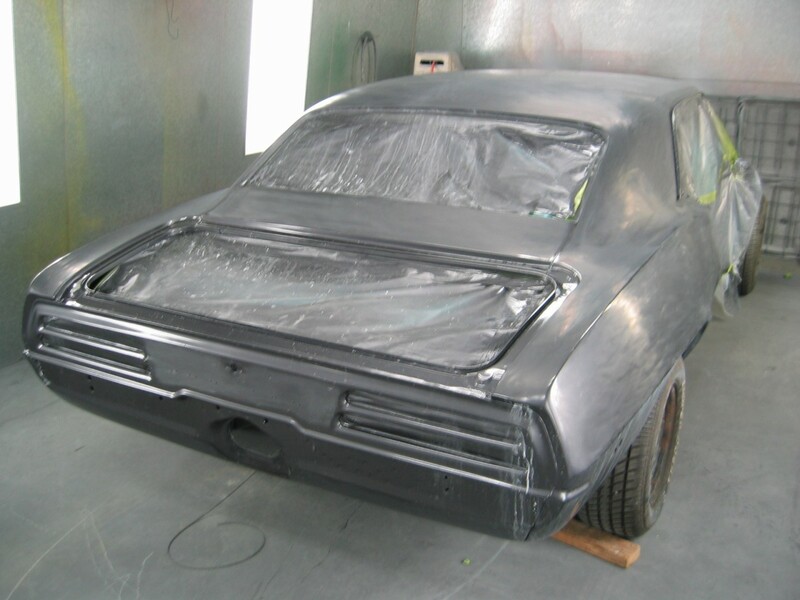 The shop had one body guy, Troy, doing all the metal and paint work on the Charger and on my Firebird. He was very nice and did good paint and body work. When my Bird arrived at the shop, Troy was completing the majority of the metal work on the Charger. While he waited for more Charger parts to arrive, he finished most of the metal work on my Bird. When the parts came in, he returned to completing the Charger. Unfortunately, right after he painted the Charger, he was riding his motorcycle and was involved in an accident with another bike. He was killed instantly. Very sad. The owner of the shop was very close to Troy. Needless to say, our cars were not the first priority for a while. My car sat untouched for almost 8 weeks while funeral arrangements were made and someone else was found to replace him. The following set of pictures were taken at the body shop. 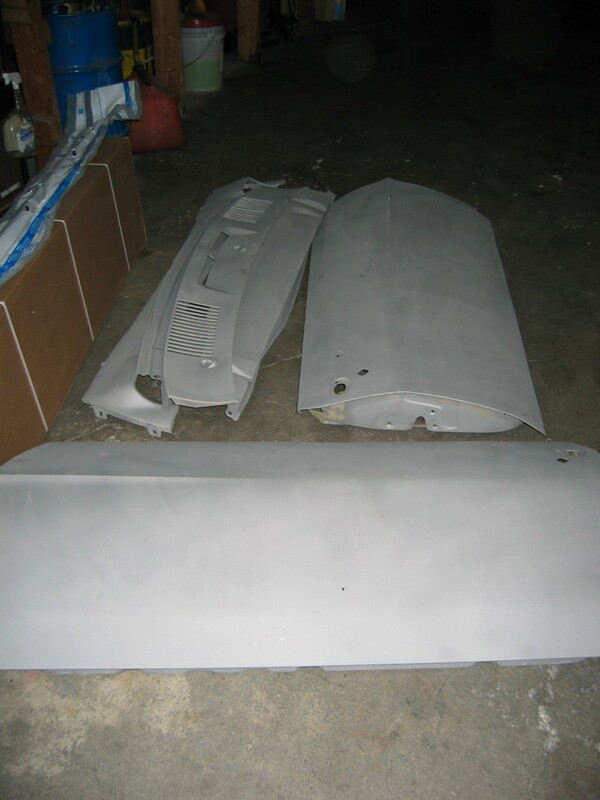 Here is the passenger rear quarter panel. You can see the bondo in the bottom corner. Troy cut out the rear quarter and left the bird-shaped marker light. 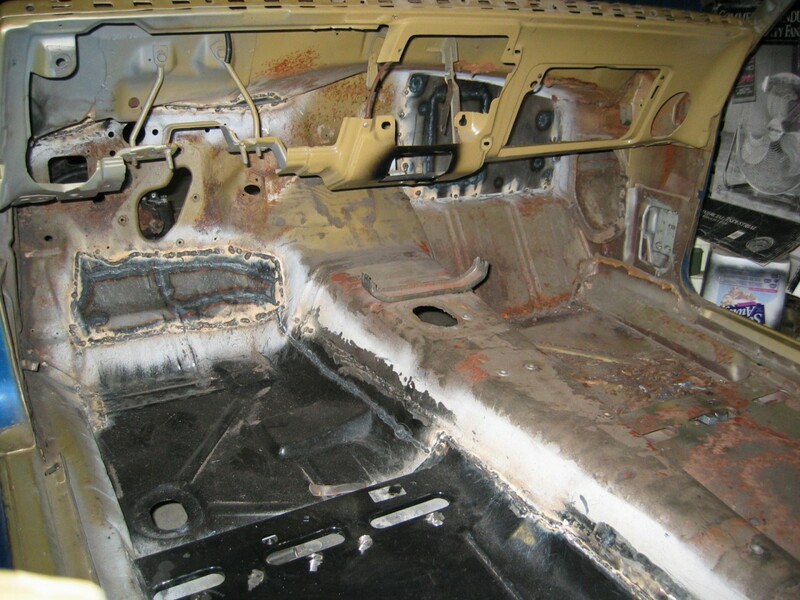 He also removed the trunk passenger lower inner panel. 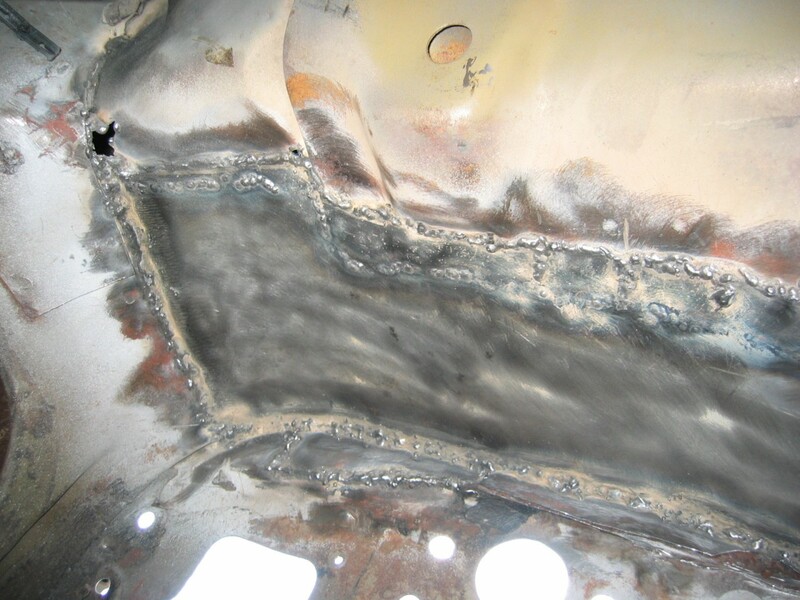 The lower wheel well had some rust damage on it too. 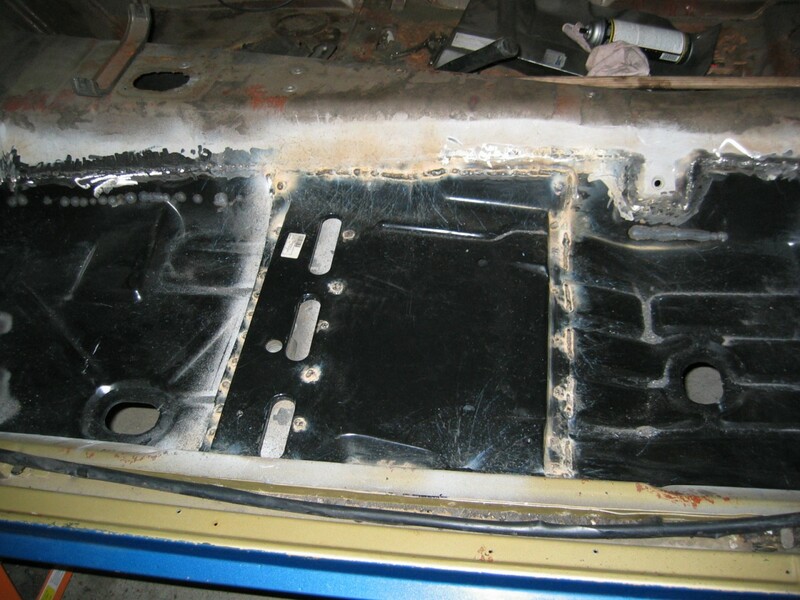 The new trunk lower inner panel is now in place. 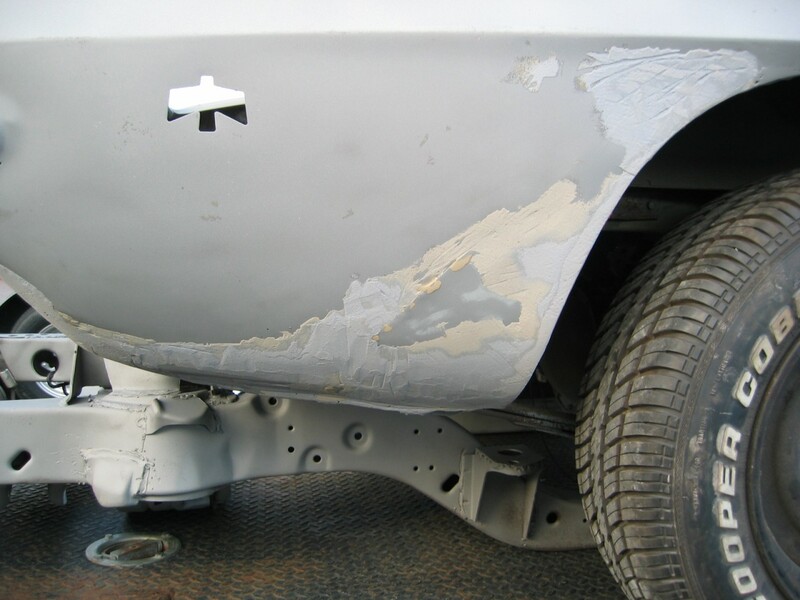 The lower wheel well damage has been repaired and covered with some body filler. 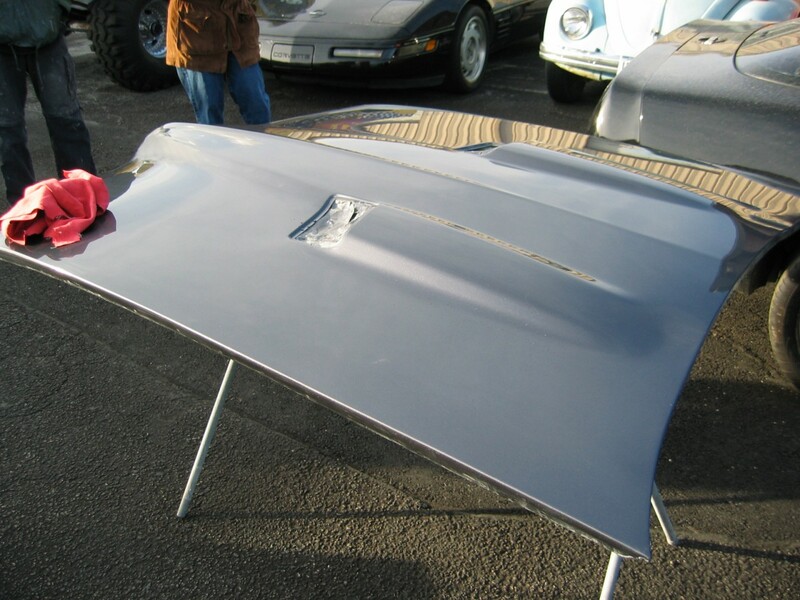 Also, the wheel well moulding was recreated on the outside edge. 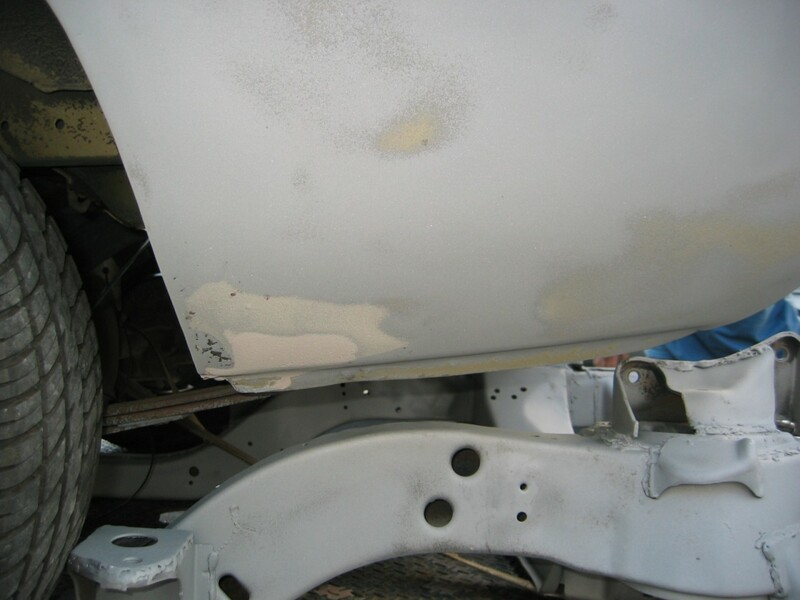 Here is another picture of the work on the trunk lower inner panel and wheel well. 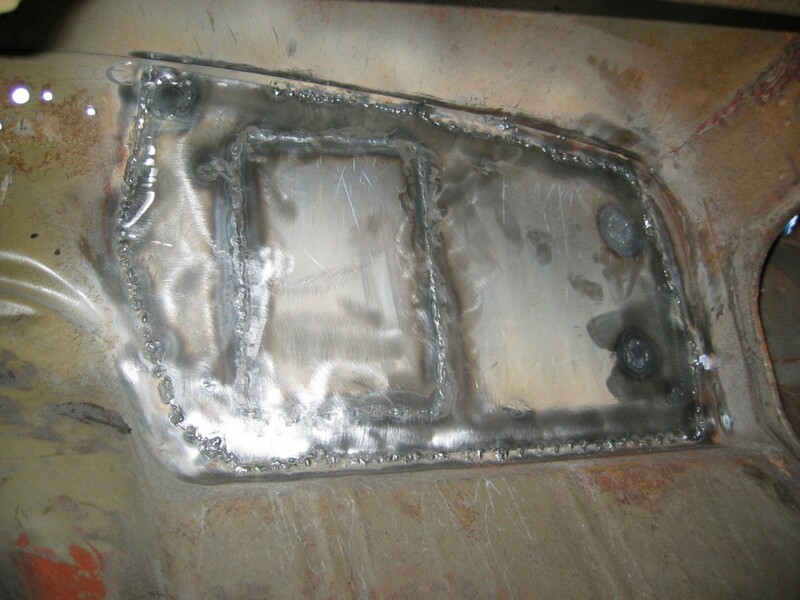 And finally...the new rear quarter patch panel was welded into place. 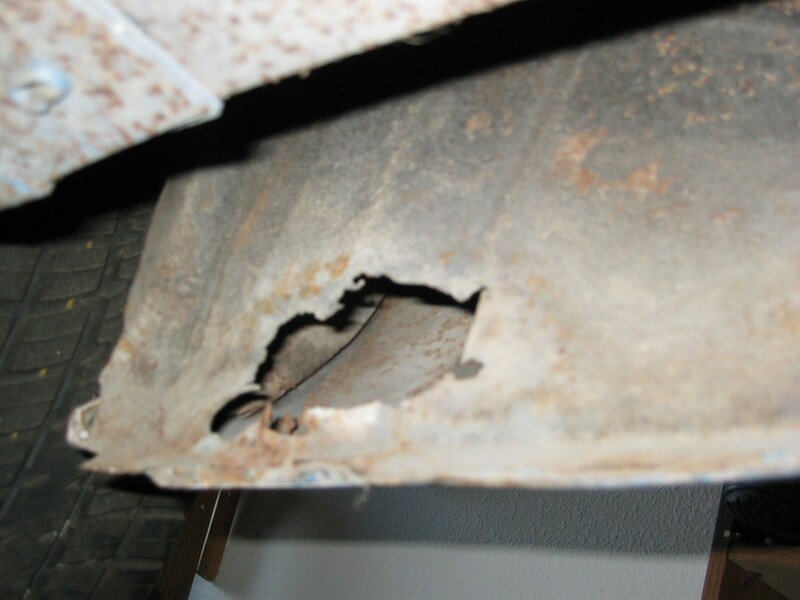 The bottom corner of the passenger rear window channel had rust that needed to be fixed. So Troy bent a few pieces of metal, and welded them into place. The same area, but viewed from a different angle. 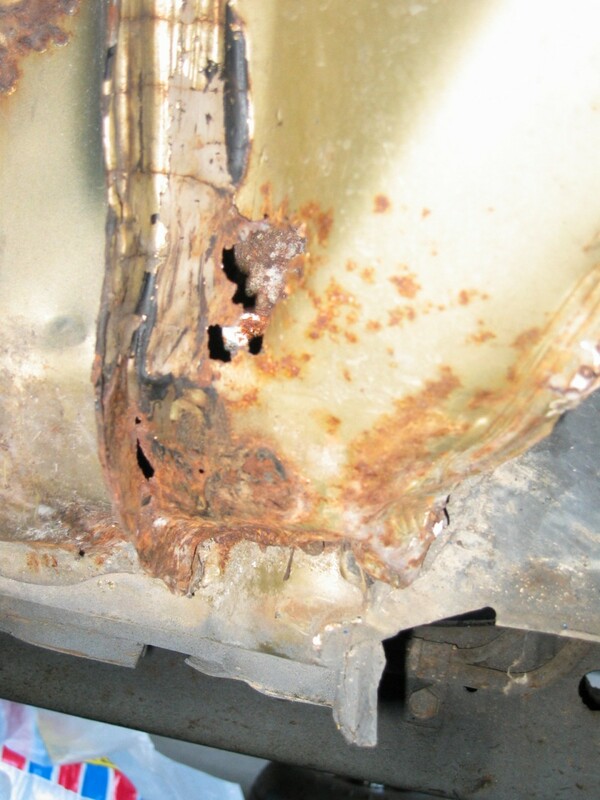 The lower windsheild channel (seen above in the Rust and Repair section) had lots of rust. We determined that the whole piece needed to be replaced. 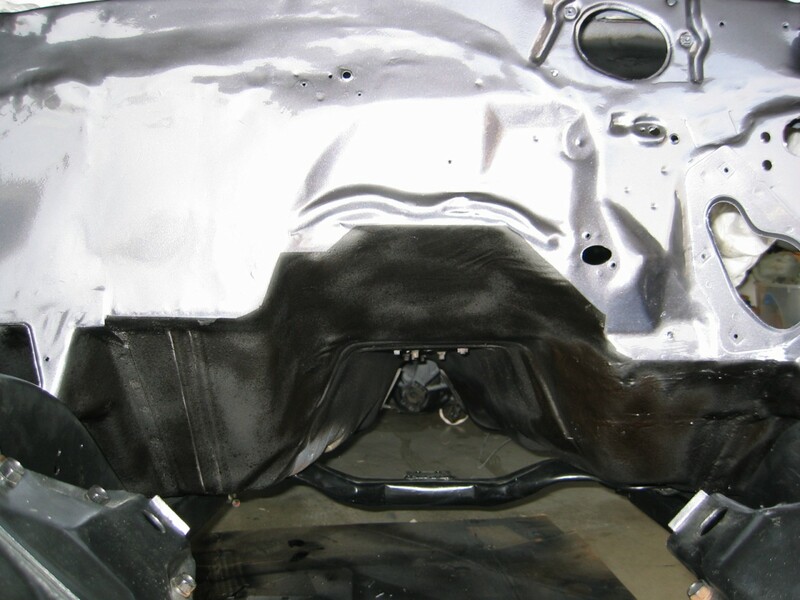 Here is a picture of the rear of the car after all the metal work was completed. Now the process of using body filler to smooth all the lines begins. 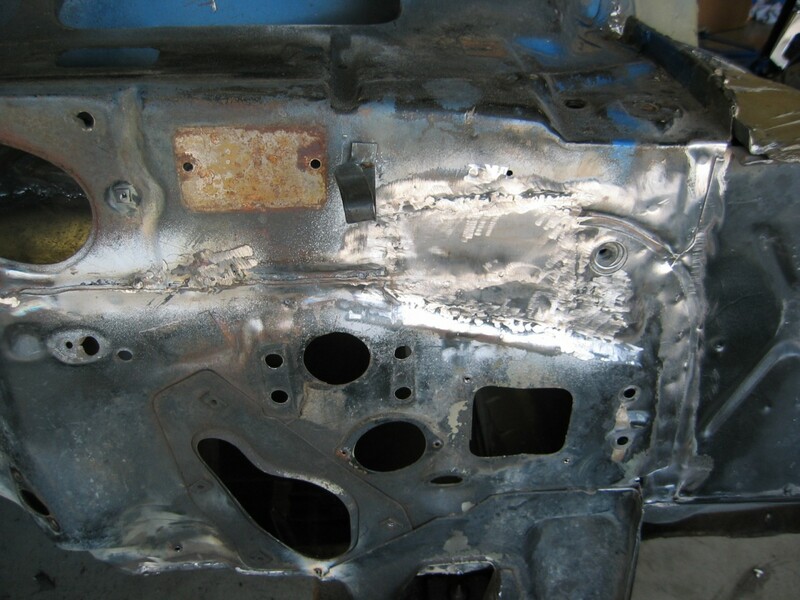 And here is a picture of the front of the car after all metal work was completed. 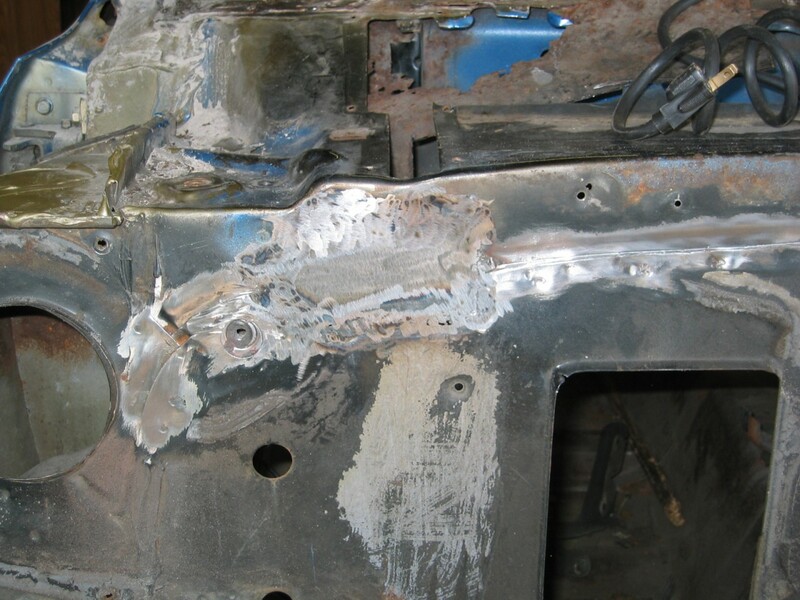 I asked them after this picture was taken to use body filler to smooth out the firewall. 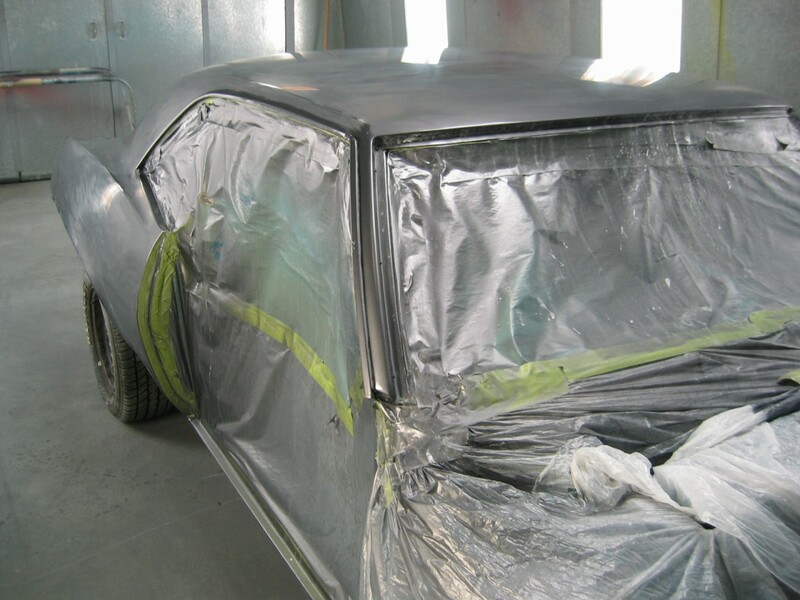 Here is the car in the paint booth after it's first color sanding. Another angle of the color sanding process. 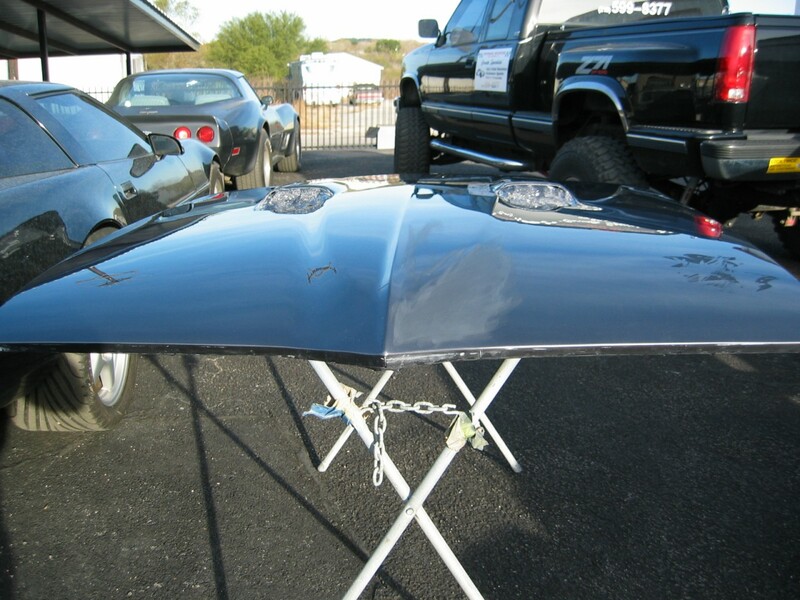 The painted hood from another angle. 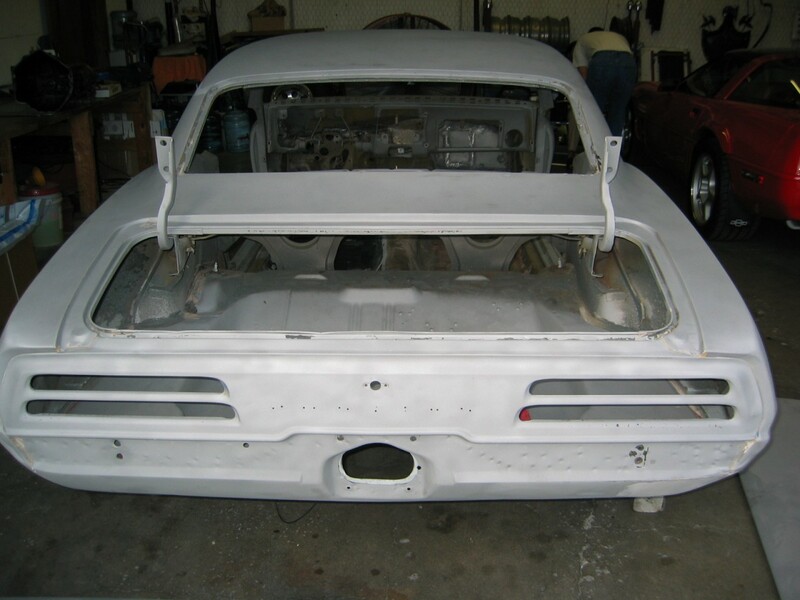 After I got the car home from the paint and body shop, I decided to make the line between the painted firewall and the undercoated underside a very defined, hard edge. So I taped and covered the firewall at specific angles and painted the lower firewall with undercoating to match the underside. You know when car enthusiasts mention that when you sand/media blast your car the stuff gets everywhere in your car? It's true. 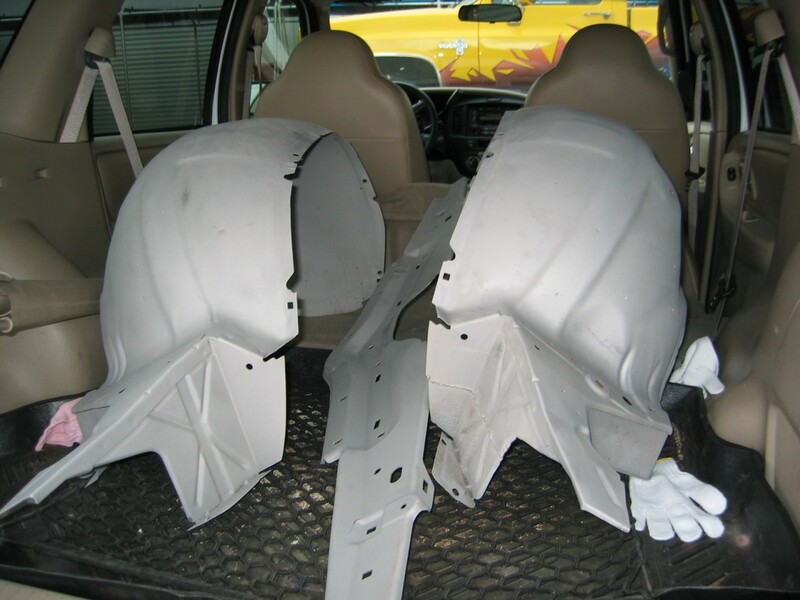 This pile of the blasting media came from the driver's rocker panel. I drilled a hole in the back of the rocker and blew air into the front. It's amazing how much came out. 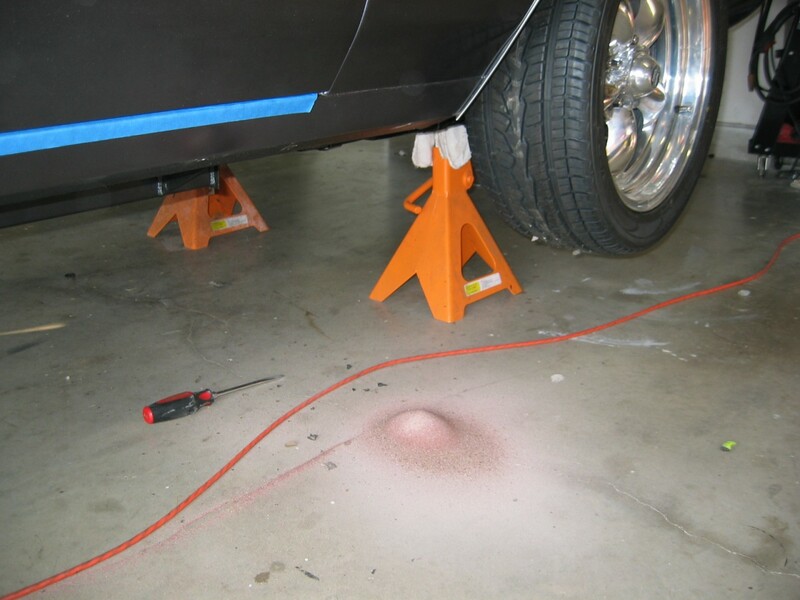 After cleaning the rockers, I coated the inside with Rust Encapsulator. 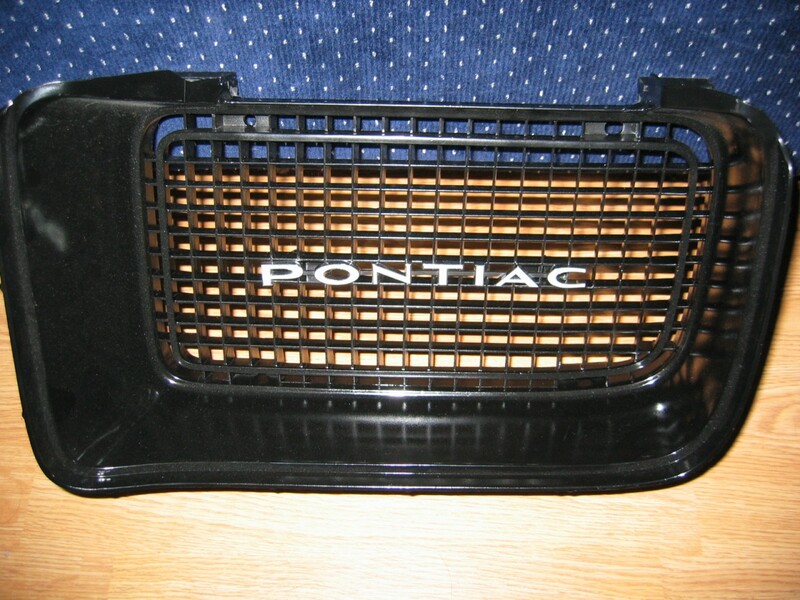 Most of the plastic tabs on both front grilles were broken or cracked after years of stress. So I went down to a plastic supply place here in San Antonio and bought some 1/8" thick plastic. Then I used my dremel tool to cut off the old damaged plastic. I shaped the new pieces and used plastic weld glue to hold them in place. It worked like a charm. Here is a picture of one of the completed grilles. You may notice that I changed the color. Originally, these grilles were silver. I changed my grilles to be black. I thought that '69 Birds look a lot better, and meaner, with black grilles up front. But hey, that's just my opinion; you be the judge.